Fresh Modesty: Creating Custom Swimwear is a 34-page tutorial with step-by-step directions for sewing an individual, well-fitting swimsuit for yourself, a friend, or a family member. I share how I draft a pattern from a series of measurements to make the various pieces of the suit as well as how to sew it all together. Countless modest style options are given including a maternity option, making it so fun to design a suit you adore. Many people are scared to death at the thought of sewing their own swimsuit. I mean, after all, isn’t Spandex a bear to work with? On the contrary! Spandex is surprisingly easy to work with. In some respects it’s easier than cotton or other fabrics because if something doesn’t line up exactly, you can just stretch it! (Where to Buy Swimsuit Fabric) Don’t I need to be an expert seamstress in order to do this? No! In fact, I had only been sewing for a year and a half before I made my first bathing suit. If you’ve followed patterns and made slight modifications with success, you can sew a bathing suit. Stuffed with detailed pictures and drawings, this eBook is perfect for the adventurous beginner. A veteran sewer won’t be bored, either, because of the wide range of style choices given. This wide range also means that the suits created will be appropriate for all ladies, young and old. From your two year old to your grandmother, they are sure to flatter. Not confident you can do this on your own? I am more than happy to answer any and all questions and give advice while you are sewing your swimsuit. Via email and my blog, I’ll be there to help! I share techniques that will encourage you to break outside the “must have a pattern, must have a perfect pattern!” mindset and show how adaptable patterns really are, and how easy it is to create your own! The skills gained in creating a custom swimsuit will excite you to explore greater heights of sewing ability! What makes this suit different from other modest swimwear options? A lot of “modest swimwear” is just one piece, making changing and using the restroom difficult. With the four-piece design, it makes this easier. Plus, since there are different pieces, you could mix and match if you wish. Support system: Usually bust support is built in to the bodice of the swimsuit. I much prefer to have it separate so that it is more comfortable and adjustable. Shirt: Sleeves or no sleeves, gathered bodice, contrasting band, sash, different necklines, and many more options are laid out. 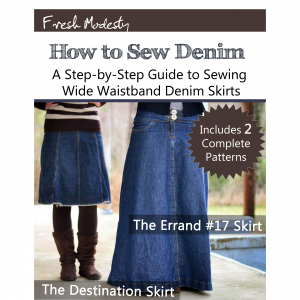 Skirt: The easiest and most flattering is a circle skirt, but I also tell how to create 3 other styles. Shorts: Create a pattern for the shorts from your own measurements. Length is completely up to you. Underwear-type lining included for comfort. If you like, you can even sew the skirt and shorts together so that it is still an easy design but you’ll have one less piece to keep track of. 😀 All in all, this eBook shows just how simple creating your own swimsuit- in any style, length, color, and size- can be! I have had this e-book for a quite a few years and made various swimsuit covers with the directions enclosed. I found the pattern maker to be very basic and it made a great custom pattern. It took me doing it a couple of times to get just what I wanted, but I am sure that is my error and not the fault of the author. I highly recommend this book. I would say the pattern making is not for a beginner seamstress, but with trial and error you can make your own suit and cover.